Following the release of their single, LoungeZotica 3000 complete the process and release a full length album – a playlist of vibrant, soulful, creatively meandering soundscapes; each of which is as expressively unique as it is satisfyingly ambient. ThunderWear as an opener is the perfect choice, more of that James Bond aura emerges (title included) – great riffs, great style and swagger, great rhythm and an overall clear-cut organic feel that just feels very genuine and in the moment. What I like about this is that during the latter half the story-line veers off unexpectedly – a touch of grit appears, the guitar solo drives the journey, and the whole thing moves itself swiftly away from the vast majority of simpler instrumental soundscapes. This is a performance – with effort, emotion, and presence. Quirido Para Mi softens the mood, lowers the energy level – a dash of bass and a heartfelt lead guitar part drive among a classic jazz backdrop. Afterwards, Shot In The Dark brings back those stylish riffs – the cool movie aura that feels like a scene or a story in itself. There are some quickly memorable moments within this piece that give it an easy to recognise flavour. Throughout the entire Martian playlist, the band allow themselves to perform freely but all the while hold close to the central energy of each composition and what the moment requires. Listen to a track like Slow Corner, for example, and the familiar vibes that emerge are expressed and added to creatively, without ever sacrificing that central comfort that you get from the music. Your interest is held, flickers of wah-wah remind you of the rock or funk aspect and help keep the journey moving forwards. The infamous Good Vibrations makes for an unmistakable instrumental that’s brilliantly arranged and performed. Leopard Skin follows with a mellow confidence that soothes the room. Then you get the quickly recognisable tune of The Good, The Bad & The Ugly, a piece the band make their own entirely and showcase once again humble but perfectly capable performances all round. There’s plenty to appreciate as this playlist pours through, in the way of both musicianship and eclecticism. 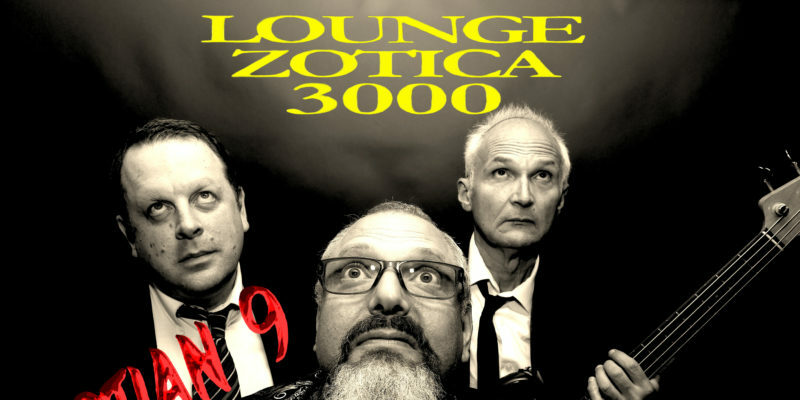 Fusing elements of swing and jazz with those that are a little funkier or even rock inspired, LoungeZotica 3000 ignite a fresh love for instrumental music with their own clearly passionate and worthy presentations. You don’t question the music, because it works so well – you just let it do its thing. Towards the very end, The Secret builds before you a late night feel – the spy theme seems to return, there’s a cool energy to the piece and it’s a fascinating one to witness in full. A personal highlight actually, impressive playing that subtly increases in intensity throughout. The Munsters afterwards finishes things up with a brilliantly nostalgic performance that’s likely to take many of us back to a much simpler time, perhaps one of far less responsibility – family nights in front of the TV come to mind. A great way to go out and a final pleasant surprise among a collection that’s exceedingly unexpected in itself. This is artful, talented musicians doing what they love to do, and it’s a blessing to listen in. Find out more via Bongo Boy Records. Find & follow Loungezotica 3000 on Facebook or visit their Website.